The Incredibles, the latest animated feature film from Disney's Pixar studios, is clever, creative and really very funny. It's also a damning indictment on modern society and culture. A sad, shallow society which, whilst desperately seeking talent amongst ordinary people, believes schoolchildren shouldn't receive grades because it marks them as winners and losers. A culture of celebrity mediocrity, in which a waitress and a plumber's assistant can star in a West End musical, and air-headed nobodies are lionised because they eat live bugs on national television. Think I'm reading too much into it? Think again. 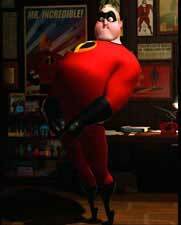 In The Incredibles, superheroes are special people born with superhuman powers. They're not discovered or created or trained up in just six weeks by a team of super experts. They just are super. Mr Incredible (Craig T Nelson) is super strong. His wife, Elastigirl (Holly Hunter), is stretchy as a rubber band, and can punch out a man from a mile away. His best friend, Frozone (Samuel L Jackson) is, well, Iceman out of Spider-man, actually, capable of freezing water particles in the air around him. But the glory days of the superhero are over. You see, thanks to our current compensation culture, people who don't actually want to be saved have started to sue. The US government can no longer afford these expensive vigilantes, racing around the skies like loose cannon in their masks and capes, randomly saving anyone in danger, whether they want it or not. And so we have the superhero protection programme, which forces hapless superheroes to live ordinary, humdrum lives in the suburbs of Middle America, concealing their superpowers like mutant freaks. 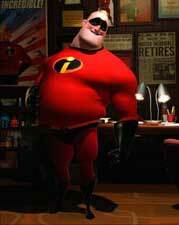 Overweight and losing his hair, Mr Incredible now works a dead end job in an insurance office, and is forever in trouble with his boss because he actually has the audacity to pay out on insurance policies. Wife Elastigirl stays home with the kids, Violet (who can create force fields and disappear at will), Dash (who can run superfast) and baby Jack (whose powers are yet to manifest themselves). Constantly uprooted every time their cover is blown, the Incredible kids are a sorry bunch: moody, miserable and in trouble at school. Dash is not allowed to run on sports day because he'll be too good. 'But Dad says my powers make me special!' he moans. 'Everyone is special,' his mom admonishes (she's obviously been paying attention to Tony Blair). 'Which is another way of saying nobody is,' Dash grumbles. Got it in one. Of course, the Incredibles can't stay normal for long, which is where the fun really starts. When Mr Incredible is mysteriously summoned to take part in a secret mission, he jumps at the chance to relive the good old days. And it doesn't take long before the whole family is drawn into a crazy adventure to save the world from an evil megalomaniac - who is, of course, an ordinary joe with no powers at all who nevertheless wants to be super. It's a great concept for a film, and it's carried off brilliantly. The characters are so wonderfully drawn, both literally and figuratively, that you almost forget they aren't real - even when they're stretching into a parachute or weightlifting with freightcars - and the vocal performances are perfectly matched. The script and plot (because, yes, strange a concept as it may seem, the creators actually took the time to write a decent script and, like, think up a plot) piss all over recent 'live action' superhero movies like Thunderbirds and Daredevil and the action scenes are really quite enthralling. The settings are wonderful too, from the boxy Edward Scissorhands suburbia of the Incredibles' home town to the remote volcanic island inhabited by their evil nemesis, which, in a perfect spoof of every Bond movie you've ever seen, comes complete with its own fleet of jets and rocket launcher. Of course. 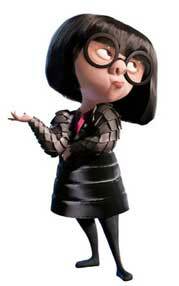 And all that aside, the film is worth seeing for one reason alone: designer to the superhero stars, Edna Mode (voiced by director Brad Bird). A terrifying cross between Andy Warhol and Janet Street Porter, she is absolutely hilarious and utterly steals the show. Witty, wildly entertaining and full of surprises, The Incredibles is like all your favourite superhero movies and all your favourite Bond films rolled into one great package, a brilliant, endlessly inventive and subtly subversive spoof that is utterly original in its own right. What more can I say? It's super.